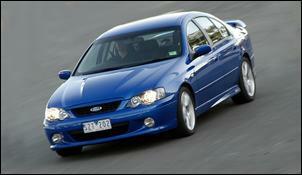 Have the latest changes to the Ford XR8 made it a better car? Ford’s BA Mark II XR8 has the potential to be a truly great car. The Boss V8 offers strong performance together with relatively modest fuel consumption, there’s plenty of interior space and comfort and that ‘power bulge’ on the bonnet gives a muscular appearance. But unfortunately there have been a few poor choices made during the development of the Mark II – choices that give a confusing end result. 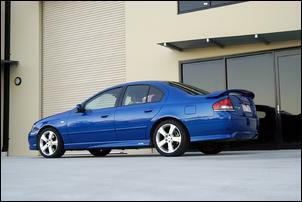 As part of the Falcon Mark II update, the XR8 was treated to upsized 18 inch wheels and low profile tyres together with 14 percent stiffer front and 8 percent stiffer rear springs. On paper, these changes seem like a good idea – Ford claims sharpened steering response, flatter ride and nimbler handling as a result. However, on ridgy-didge Australian roads, these changes conspire to increase harshness and give a poor ride on anything but a smooth surface. The coherence of the original package has been lost. Interestingly, damper rates appear unchanged despite the Mark II’s increased spring stiffness – and the result is a car that feels floaty when punting along a mountain road. It’s clearly under-damped. Combine these suspension characteristics with the harshness of the new low profile tyres and you have a chassis that’s best described as "unmatched". The traction control system is also overly active. The system shuts down the engine when you’re hard on the accelerator out of relatively easy corners and sometimes causes you to lose rhythm. But switch off the traction control system and you can enjoy the handling balance of the BA XR chassis – it really is balanced and progressive. The standard LSD does a good job getting grunt to the road and outright grip levels are high thanks to 245/40 18 Dunlops. Big news is the introduction of a Tremec T56 6-speed gearbox together with a shortened diff ratio. This is another update that looks good when you flick through the marketing gloss, but the all-round gearing needs some attention. The Boss 260 engine simply doesn’t have enough low-down grunt to pull the tall ‘cruise’ gears. Ford claims fifth gear is tractable around town at 60 km/h. Yes, it’s tractable but it just doesn’t have any decent get-up-and-go in these conditions. We found best response using only 1st to 4th gear in urban situations. Furthermore, the new driveline is quite clunky – not at all in keeping with the sweet engine. 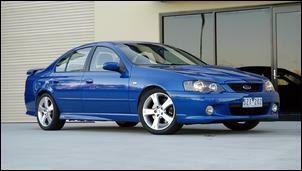 Interestingly, the XR8 manual has almost the same gearbox ratios as the Falcon XR6 Turbo variant. First gear is shorter on the XR8, but the XR6T has shorter gearing overall thanks to its diff ratio – 3.73:1 versus the XR8’s 3.46:1. Note that the XR6T also has a broader spread of torque (450Nm from 2000 to 4500 rpm) to make it more flexible in high gears. 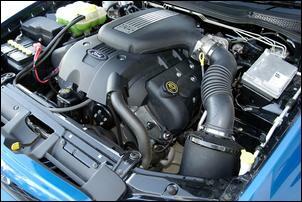 The Boss 260 engine is the XR8’s star attraction. Take an Australian-spec 5.4 litre V8, give it DOHC, 4-valve heads, a cross-ram intake manifold and electronic throttle control and you’ve got a truly modern V8. It’s stunningly tractable, responsive (when driven in a suitable gear) and comes on with real urgency above 4000 rpm. Peak torque (500Nm) arrives at 4250 rpm and peak power (260kW) is accessible at 5250 rpm. Drive it hard and it’s obvious this is a fast car. Despite a kerb weight of 1800kg, we recorded a mid 6 second 0 – 100 km/h pass with no effort at all. We imagine low 6s could be achieved by perfecting launch technique and shift points (Ford neglects to give you a redline on the tacho). Equally as impressive as its straight-line acceleration is the XR8’s fuel consumption - when compared to its Holden/HSV rivals, anyway... We recorded a very creditable 12.4 litres per 100km during our mainly open-road test. The tall gearing obviously helps in this department. Note that the engine’s 9.5:1 compression ratio also allows use of normal unleaded – no need to use expensive high-octane fuel. Slowing the XR8’s speed are standard twin-pot ventilated front and single-pot solid rear discs with 4-channel ABS control. 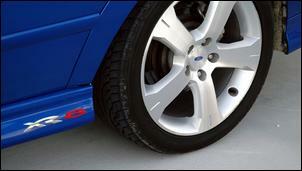 But note that our test car was equipped with AUD$2950 premium brake option with grooved front discs. These give good pedal pressure and performed well during our test. The power-assisted steering is fine overall but lacks the on-centre feel and precision of a true performance car. We’d like a more direct steering ratio and/or less power assistance on-centre. 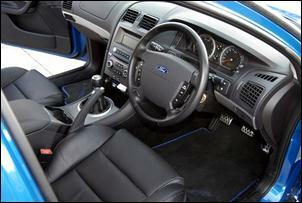 Unfortunately, the XR8 cabin has relatively few distinguishing features. Your 51 grand buys a base-spec B&W centre LCD, just two airbags and no climate control. You do get XR sports trim, cruise control, auto headlights (new for the Mark II) and a middle-of-the-road 6 disc CD sound system. Oh, and the flimsy flip-up centre console lid of the first generation BA has been replaced with a marginally improved rubber cup holder. Our test car was equipped with AUD$1980 optional leather trim that, although quite hard, appears long-wearing. Front and rear occupant space is generous and the cabin is very comfortable aside from those ride quality issues. Our test vehicle also suffered a low frequency resonance from the rear at highway cruise. Visually, the BA Mark II XR8 is muscular without being overt. Its body kit is attractive and the ‘power bulge’ (which is necessary to accommodate the cross-ram intake manifold) adds a touch of traditional muscle car style. Peering over this bulge is a constant reminder that you’re not driving an everyday Falcon. The big 18 inch wheels are also simple but attractive. As it stands, the BA Mark II XR8 is a pretty good machine. It scores very well in terms of performance, fuel economy, interior space and accomodation – it’s a pity that it is let down by a few poor design choices. Certainly, this is a car that begs for some relatively minor aftermarket tweaking.